TAMA's HTC77WN combination tom and cymbal stand offers drummers a compact way to mount both a tom and cymbal on a single, high-quality stand. A superior design and material selection yield an overall quieter stand with superb isolation between each element for dependable noise control. 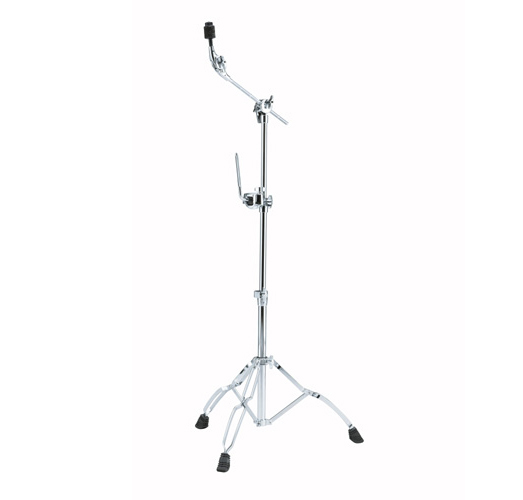 And despite the HTC77WN's small size, it packs performance stability and easy serviceability that define the meaning of professional in a drum stand. If you're looking a compact, portable, and low-noise combination tom and cymbal stand, the HH77WN won't let you down. By simply gripping and pressing the two buttons on the sides of the unit, users can attach and remove the Cymbal Mate with just one touch. This makes setting up cymbals a snap. Of course, as is the case with an ordinary Cymbal Mate, it's easy to make fine adjustments to cymbal swing by rotating the unit. With its rock solid stability, TAMA's Omni-ball system has been acclaimed by pro drummers for well over twenty years. You can achieve almost any angle by loosening one T-nut. Are cymbal stands just for supporting cymbals? We think cymbal stands are also musical instruments. All TAMA cymbal stands in the Roadpro and Stage Master lineups were designed with the elimination of stand noise a top priority. A special rubber cap at the end of the upper tube eliminates swaying and rattling, and a special nylon sleeve underneath the die-cast joint of the base section further reduces swaying. A die-cast joint combines the T-nut/bolt with a pressure plate with a Nylon Bushing. With this design, the removal and replacement of worn bolts or bushings is fast and easy.